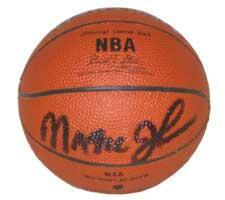 Magic Johnson Autographed NBA Mini Basketball by Spalding | Sports Memorabilia! Magic Johnson Autographed NBA Mini Basketball by Spalding. Signed in black. This mini basketball is 5 inches in diameter and is made out of the same material as the Indoor/Outdoor basketball. A NSD numbered hologram and NSD certificate of authenticity is included. Inducted into the NBA Basketball of Fame in 2002 and in 2010 as a member of the "Dream Team."